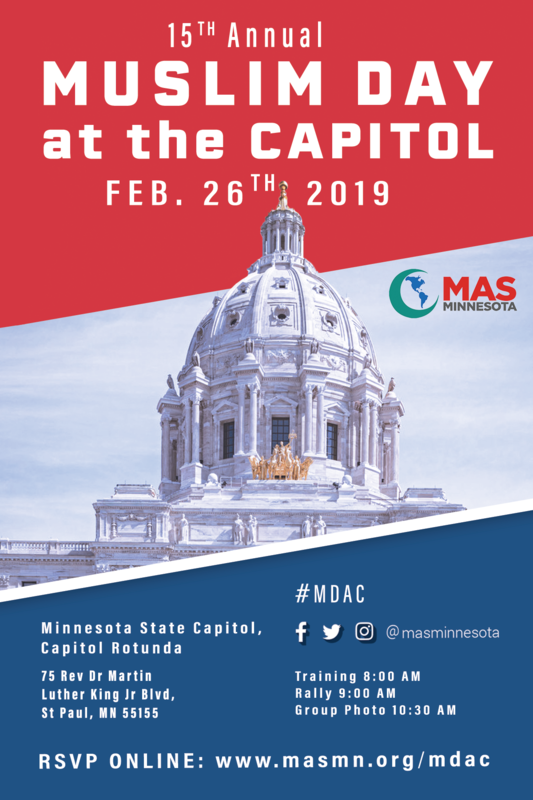 The 15th Muslim Day at the Capitol (MDAC) is on Tuesday, February 26th, 2019. You can help convey the concerns and needs of the Muslim community to our legislators. Group Leader Training is provided for participants on how to lead their groups and lobby legislators for your concerns. The training is scheduled to start at 8:00 am in Conference Room 317A, 3rd Floor, State Capitol. All other attendees are invited to the welcome session at the State Capitol Rotunda at 8:30 am. A group photo is held at the state capitol at 10 am. We encourage everyone to attend the photo session. Group training is held at 10:20 am at the State Capitol Rotunda. Attendees go in small groups to meet with legislators and speak to them about Muslim concerns. We are making appointments on behalf of attendees as of now. Please check with your group leaders on your district appointments. The Muslim Day at the capitol is organized by The Muslim American Society of Minnesota (MAS MN) in partnership with Islamic Association of North America (IANA) and The Muslim Coalition of ISAIAH (MCI).